Here are a few stats you may not know from the Packers 20-3 win over the Bucs. 1. The Packers now hold a 31-21-2 advantage over Tampa Bay. They are, however, only 3-4 against the Bucs since 2002, and have only beaten Tampa Bay twice in the last nine trips into Tampa Bay. 2. 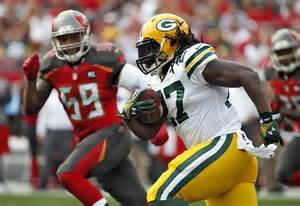 Eddie Lacy has now gained 1,000 yards in consecutive seasons. It is the first back-to-back 1,000-yard rushing season for a Packers running back since Ryan Grant did it in consecutive seasons in 2008 and 2009. Other Green Bay running backs (in addition to Lacy and Grant) with consecutive 1,000-yard rushing seasons: Jim Taylor, John Brockington and Ahman Green. 4. Randall Cobb had 11 catches for 131 yards in the contest. It was the 29th game where a Packers player had 10+ catches and over 100 yards receiving in a game. It was his second career game with these numbers, making him the eighth Packers receiver to have multiple 10 catch/100 yards receiving games. Donald Driver and Sterling Sharpe each had six such games in their careers. Others with multiple games: Robert Brooks, Antonio Freeman, James Lofton, Jordy Nelson and Javon Walker. 5. The Packers defense held Tampa Bay to only 109 total yards in the game. The Packers have now won nine straight games when they hold the opposition to under 150 total yards in a game. In the Super Bowl era the Packers have held opponents under 150 yards 20 times, compiling a 16-3-1 record. 6. Green Bay had seven sacks against the Bucs, the 28th time in history that have reached the seven-sack mark in a game; they are 26-2 in such games. The Packers are 28-9-1 since 2000 when they have five or more sacks in a game. 7. The Packers have now reached the playoffs in six straight seasons, matching the 1993-98 Packers for the longest streak of consecutive post-season appearances. 8. Yesterday’s game was the 15th time since 2000 that the Packers have held opponents to three or fewer points in a game. The Pittsburgh Steelers lead the league with 20 games holding the opposition to three or fewer points this century. Baltimore has 19, Seattle and San Francisco are tied with 16 each. The Packers are tied with New England and Tampa Bay for fifth on this list. 9. This will be Mike McCarthy’s seventh post-season appearance as Packers head coach. He is now only one post-season behind Curly Lambeau, who had eight playoff seasons as Green Bay coach. Other Green Bay coaches who made it to the post-season: Mike Holmgren (six seasons), Vince Lombardi (six seasons), Mike Sherman (four seasons), Dan Devine (one season), Bart Starr (one season). 10. Lacy had exactly 99 yards rushing in the contest, missing the 100-yard mark by a single yard. It was his second 99-yard rushing game in his short career with the Packers. He is now tied with Dorsey Levens for most 99-yard rushing games as a Packer with two.